Was the KONY 2012 media campaign just a flash-in-the-pan or a gigantic victory? It’s too early to tell. KONY BALONEY OR A MODEL MEDIA CAMPAIGN? Let’s wait 6 months to pass judgement. Gotta see how it shakes out. I often open my talks with the warning, “For some of this stuff I’m making it up as I go along.” But then I add, “However, in today’s rapidly changing media world, if you’re not making part of it up as you go along, you’re probably not connected with the cutting edge.” There’s just no reliable sources for knowing how things like Twitter work. It’s only been a couple years since everyone went Tweet-crazy — there hasn’t been enough time for textbooks to be written on how exactly it works. You have to try and figure the rules out for yourself. Same thing for the KONY 2012 video. Well, I have no “Action Plan.” Never have. Some of us don’t have our lives all planned out — we live it day to day, in the moment, spontaneously, trying to listen to the world around us and make things up as we go along. So I took exception to their blowhardiness. I pointed out that Action Plans are easy, enthusiasm is rare. Lots and lots of causes have Action Plans that accompany them to their graves. Only a few have genuine enthusiasm. It’s now more than a half year since OWS was born. No, it hasn’t changed the nation, but yes, they did succeed in creating a symbolic milestone surprising many cities with how broad of a chord they had hit. And they’re not done. The fire is still there, they are maturing, and may slowly be assembling an Action Plan, which is fine. So I suggest we all hold off judgement on KONY 2012 until six months have gone by. In September it should be possible to say whether it truly was just a “flash in the pan” or whether they scored big by having made “Kony” into a buzzword with enormous name recognition that’s worth its weight in gold. I’m willing to go with the latter. It’s impossible to obtain “the metrics” to reflect the value of such huge name recognition, but suffice it to say pretty much EVERYONE wants it for their cause or products. These folks, complete with their naked masturbating fearless leader, did what millions of others have failed at. I’m willing to bet that by September people will still remember Kony. 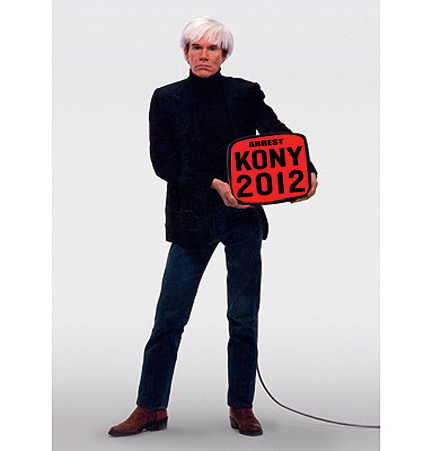 Marshall MacLuhan and Andy Warhol would be applauding the Kony campaign.